In a highly competitive environment, strategic collaborations are identified as crucial for success by companies operating in the global magnetometer market. In addition to this, several companies are focusing on research and developments to introduce technological advancements, finds Transparency Market Research (TMR) in a new study. For instance, Lawrence Berkley National Laboratory developed an optical atomic magnetometer, which is fashioned to induce better efficiency in MRI systems. The company was awarded with the US patent for this product on 2012. Such innovations not only help companies in strengthening their foothold but have significant impact on the market enabling it gain from the latest technological developments. Besides this, companies such as Conon, Inc., Cryogenic Limited, Geometrics, Inc., Infineon Technologies AG, Honeywell International, Inc., and Parton Elecom Corporation, Ltd among others are exhibiting significant growth in the global magnetometer market. According to TMR, the global magnetometer market is expected to reach US$13.66 bn the end of 2025. The market’s revenue was pegged at US$8.25 bn in 2016. Considering these figures, the global magnetometer market is poised to surge at 8.7% CAGR between 2017 and 2025. Among the key application segments, the consumer electronics segment holds maximum potential for growth. According to TMR, the consumer electronics segment is likely to rise at a CAGR of 8.26% between 2017 and 2025. Regionally, North America held lead in the global magnetometer market in 2016. Over the years, several factors have proven crucial in supporting the market’s trajectory. However, recent innovations have helped the market realize increased potential. These innovations have enabled magnetometers reach maximum sensitivity without using cryogenic cooling. This process has thus achieved breakthrough in developing MRI and NMR equipment of smaller size with reduced operating expenses. Similar advances have enabled magnetometers deliver accurate predictions on drug delivery thereby facilitating pharmaceutical development. As these factors continue enabling growth, the global magnetometer market is expected to tread upward due to its ability of producing low cost MRIs for noninvasive diagnostics. Besides this, the rising investment in portfolio of magnetometer sensors will enable the market gain momentum in the coming years. It is important to note in this regard that investment is observed across diverse industries such as defense and aeronautics, consumer electronics among others. Also, move toward automation in consumer electronics as well as defense applications will create lucrative prospects for the market. The scenario holds true in case of developed regions that display early adoption of the latest technologies. While market value may remain lower in case of emerging nations, experts project the market to witness highly lucrative prospects as governments adopt initiatives for strengthening their industrial infrastructure. 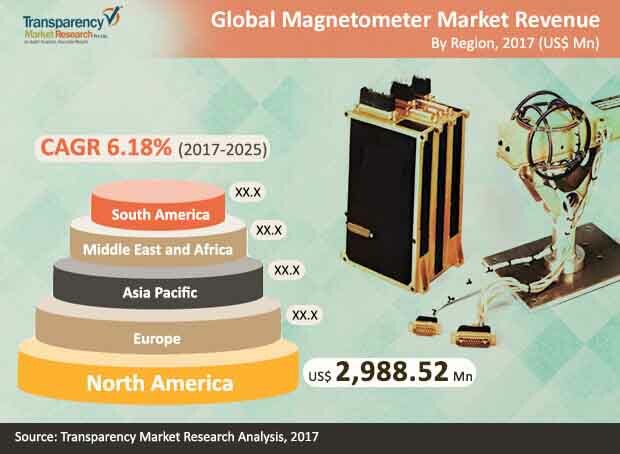 The companies operating in the global magnetometer market are currently focusing on standardization, innovation, and achieving process efficiency. This will also bode well for the global magnetometer market. The rising demand for consumer electronics witnessed worldwide will also aid the market’s expansion in the forthcoming years.